Jim Lovgren is the owner and operator of the "Sea Dragon" fishing out of Point Pleasant Beach, New Jersey. Captain Lovgren is a fourth generation commercial fisherman, is on the Board of Directors of the Fishermen's Dock Cooperative [ ] in Point Pleasant Beach and has been a leader in the New Jersey Farm Bureau from monmouth County for over ten years. 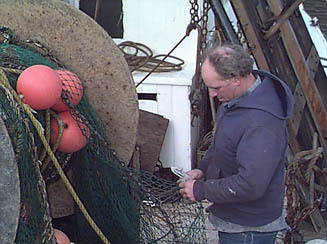 He is a member of several state and regional fisheries advisory panels and a Director of the New Jersey Seafood Harvesters' Assocation as well. The "Sea Dragon" is a smaller, wooden stern trawler that is seventy feet long. Jim mainly targets whiting, fluke and squid and makes short trips of three days or less, fishing the waters of the New York Bight.